Woo hoo! I didn't forget about the Reader's Choice poll this year, I've just been a little crazed. Let's see if we can get more votes in this year. Will the previous winners take the top spots again? Or will your new favorite ramen/cafe/chirashi spot/coffee shop/bistro win the votes for being one of the favorites in Taipei? Voting will be open from November 28, 2012 - December 20th, 2012. There must be a minimum of 5 categories filled out (with different restaurants) in order for the vote to be counted. For example, you cannot fill out the same restaurant in 3 categories and nothing else. But if you really love that restaurant, vote for it in the applicable 3 categories and fill out 4 other categories, then it will count. 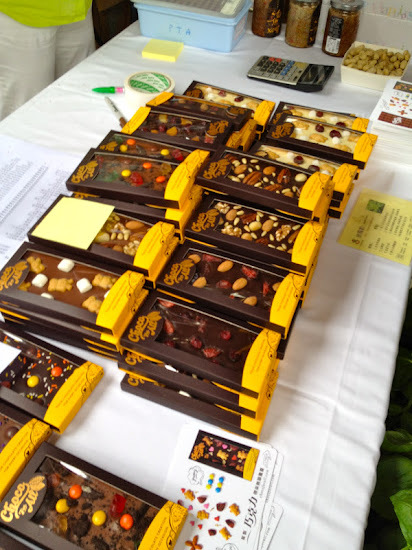 I will tabulate and hope to announce the winners with a write up by end of January 2013 (fingers crossed!). Remember there must be a minimum of 5 categories filled out (with different restaurants) in order for the vote to be counted. For example, you cannot fill out the same restaurant in 3 categories and nothing else. I reserve the right to cancel out votes that look like cut and paste by the same person/people. 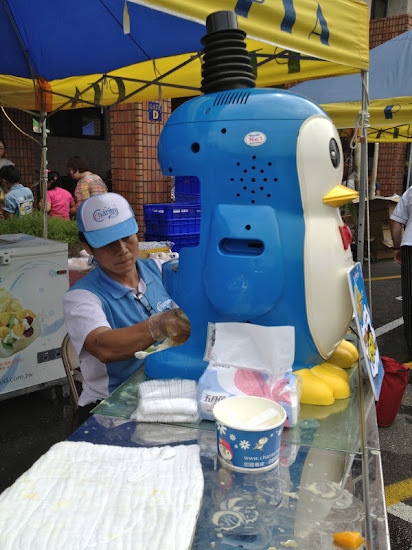 Yong Kang Street is even more accessible now with the opening of the DongMen MRT stop last month, and will strengthen Yong Kang Jie as a "must eat" tourist destination for Taipei. Adventurous diners looking for real Taiwanese flavors should definitely include Lu Sang on their list. I first tried it a few years ago, as it was one of grandma's favorite places to go for Saturday night family dinner. She loved ordering a whole table full of eats and then treating everyone, exclaiming that the whole dinner was cheaper than than a few dishes at other fancier Chinese restaurants and the food was just was good, if not better. Quite a few other people felt the same way, as it was always crowded when we went for dinner, often with people waiting in front for a table on one of the two floors. Earlier this year, HungryinTaipei was featured in the CNNGo's article of top 40 Taiwanese eats (look for one of my favorites at number 30). 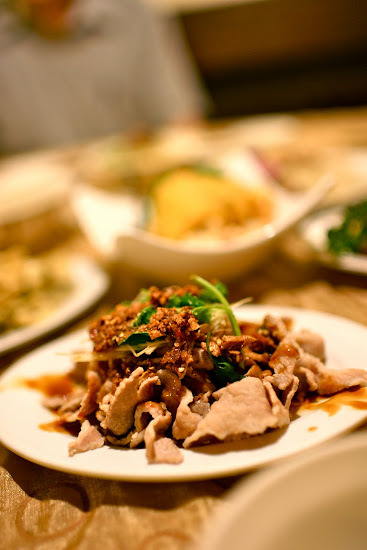 While the list can't cover everyone's favorite, you can find a great bowl of lu rou fan or braised pork rice (number 1 on the list) Lu Sang, as well as a number of under the radar dishes. 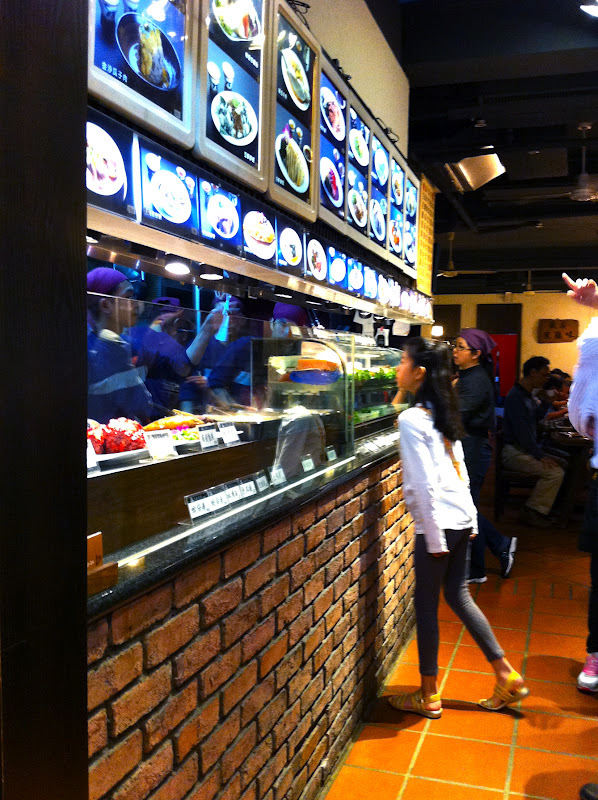 The menu of Yilan dishes is on the wall- brightly lit to point and order. Or you can check out the eats on the counter top. Once you order, the food comes quickly to the table. 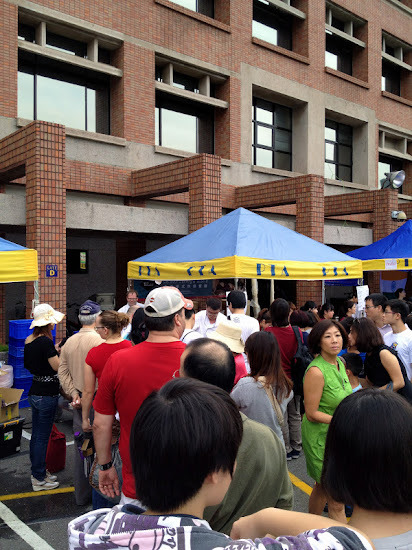 The selection can be intimidating for a newbie with the large selection and names only in Chinese... I've been there multiple times and sometimes I still have to double check the wall when I go. There's a lot on the menu to explore, but here are my top 3 eats that I must order everytime I come to Lu Sang (and that I think you should too). With all the deep frying craze in the US (deep fried oreos? twinkies? avocados? butter?! 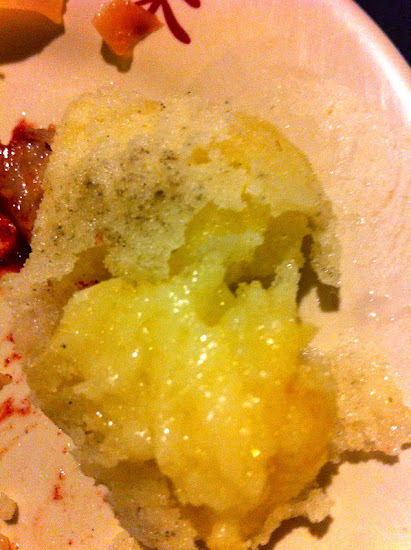 ), this is something you might imagine seeing at the county fair or at a Michelin starred restaurant, plated prettily with some foam. But instead you can enjoy this Yilan delicacy at Lu Sang. 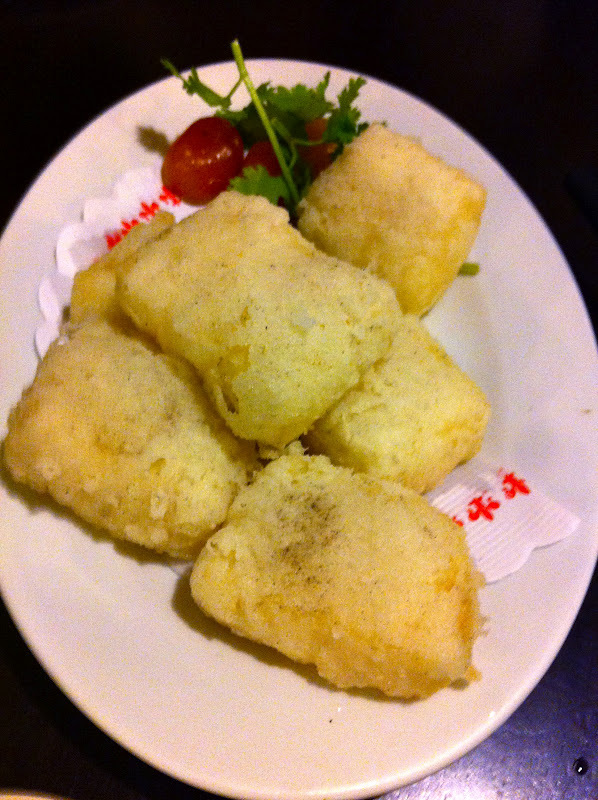 The first time I tried it, I thought it was fried tofu, but it was a bit too creamy, too silky, too tasty. When my relatives tried to explain to me what it was, they couldn't quite do it. 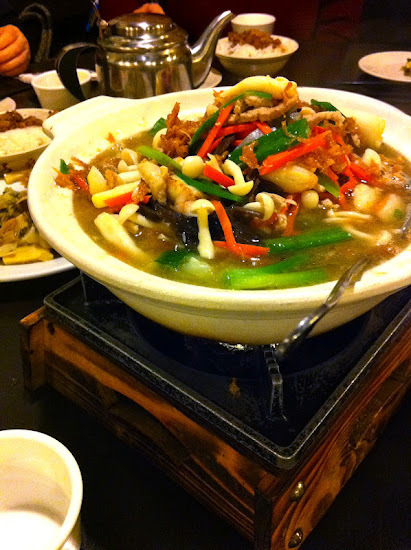 Some internet research showed that gao zha is chicken broth mixed with flour, chilled and sliced into cubes then coated with flour to deep fry. Don't make my previous mistake and accidentally order the fried tofu since the photos look quite similar.. it's definitely not as good. Just remember gao zha! 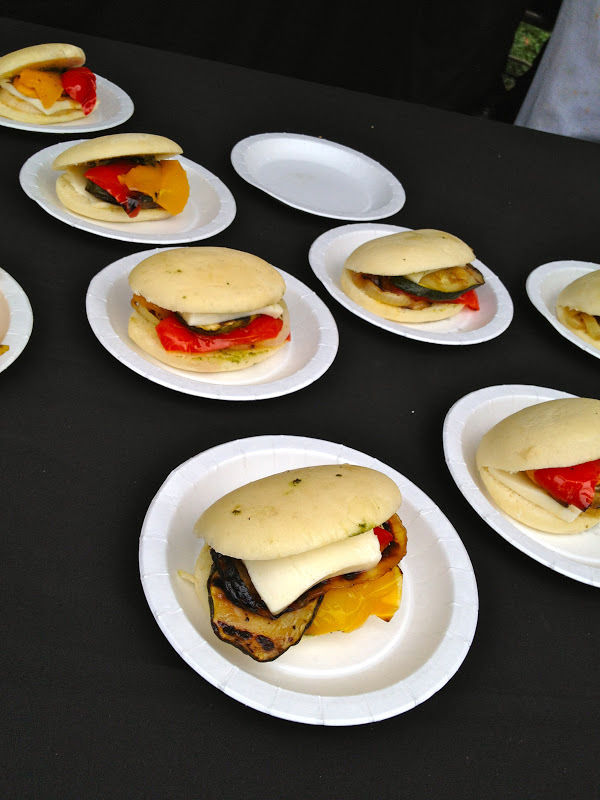 The result is amazing, though very very hot, so be careful with your first bite. I often cut mine in half to let the steam out and then take a bite of the crispy exterior and let the rest melt in my mouth. (2) Sliced pig's liver (NT$100) To me, this tastes like a chilled foie gras- with that same creaminess and sweetness to be savored. It's one of those dishes that tastes much better than it looks. 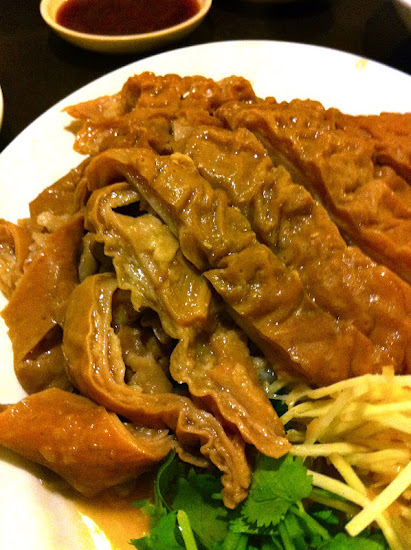 (3) Sliced cold chicken (NT$180)- usually very tender and juicy, each slice covered with the gelatinous textured skin. One of the more accessible dishes for those that don't want to eat livers or intestines. The meat is similar to Hainan Chicken, but the skin is almost crunchy. Red Rice Wine Ang Chow Pork (NT$150) -the sauce is sweet and you can slightly taste the alcohol from the glutinous rice wine that's used to make it. I've had times where the pork is very tender (like a roasted char siu) and other times where it was a little tougher/drier. Steamed pork with pickled cucumber with salted egg yolk is like a sweet and savory mini meatloaf, best paired with a bowl of rice- sweet from the Taiwanese style pickled cucumbers and savory from the soy sauce and creamy salted egg yolk atop. I like this dish, but no one else at the table really appreciates it and it's too big for me to finish myself. Instead of tea, there's complimentary hot kumquat tea available to self serve in the back. Bottles of the syrup are available to purchase to make at home. You could always make it a mini meal on an eating tour of Yong Kang Street, instead of lining up for Din Tai Fung, you could hit up the Knife Shaved noodle or the dumpling place and then grab the gao zha and pig's liver and then getting some mango ice. I've never seen any non Taiwanese diners at Lu Sang, but maybe after this post, I'll be seeing a few of you there. 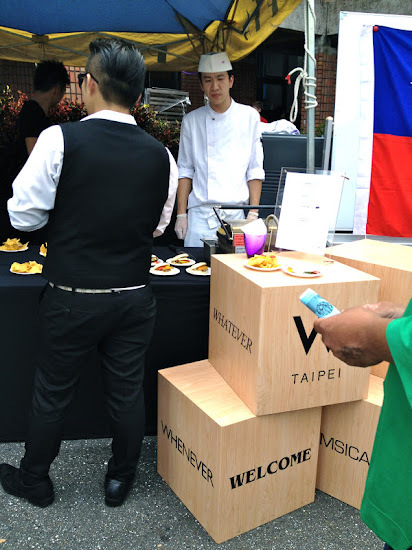 Hungry in Taoyuan? Does it have the same ring to it? First time noticing the beef noodle soup (NT$150) on the menu at Chun Shui Tang, while looking for a place to eat at Taimall in Taoyuan. At Chun Shui Tang, I usually ask for the English menu, even though it doesn't actually list everything that's available on the real, check off menu. 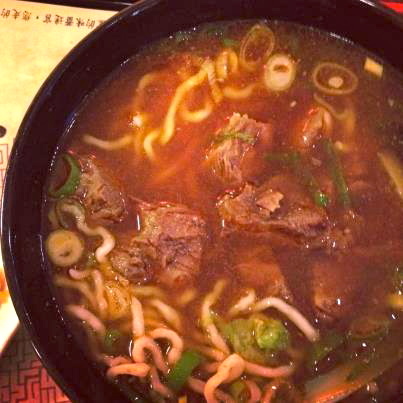 So if you're looking for something more than dim sum and drinks, the most filling dish is probably the beef noodle soup. I was pleasantly surprised by the chewy, chubby noodles, the slightly spiciness of the broth and the abundance of tender beef in the bowl. 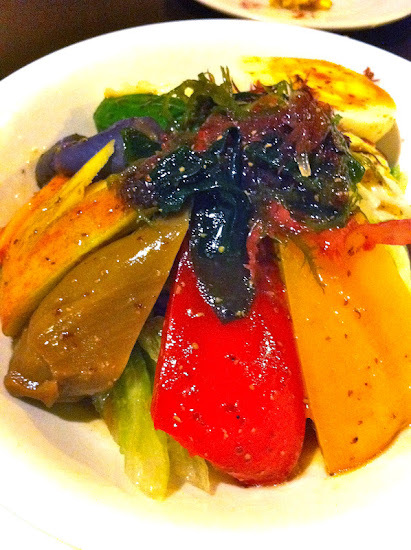 Add the provided pickled vegetables into the dish for a sweet/savory taste and texture to complete the experience. 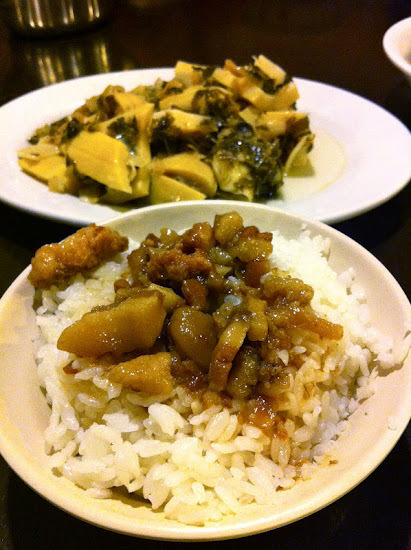 Also get the fried radish cakes and pearl milk tea, and enjoy the old school tea house ambiance. There's also a Chun Shui Tang at the Taoyuan airport, and at Taimall there's also Starbucks, Movenpick Cafe, Coldstones, Dunkin Donuts, KFC, McDonalds, Sushi Express, 3 Baboons, Casa de Pasta, Karen Teppanyaki, Mr. Onion, Ponderosa and of course, lots of Chinese food and a food court. 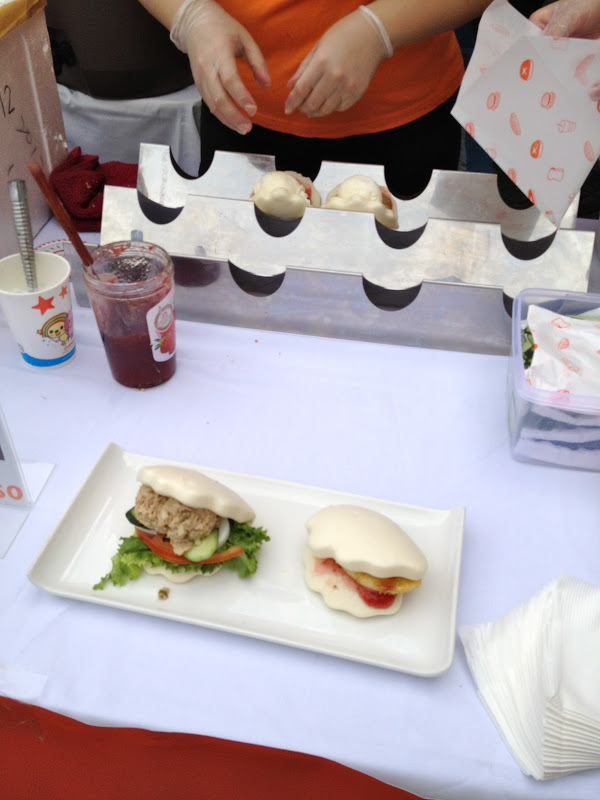 news/restaurant roundup: where can you find... Thanksgiving in Taipei 2012? I'm thinking about turkey already. When I first moved back to Taipei over seven years ago (! ), one of the holidays I missed most was Thanksgiving. It is really one of the holidays I remember celebrating with my family growing up, and our meals were always a unique American _and_ Chinese spread on the table... turkey stuffed with sticky glutinous rice (my mom's recipe), stir fried green beans sweetened with sugar and soy sauce (my dad's recipe), my favorite candied sweet potatoes, or creamed corn out of the can (my sister and my contribution as kids). Ha ha. Being apart from my parents and family in Taipei for this holiday, I always tried to figure out how to capture the experience away from home, not always succeeding, especially since I didn't know where to find it. (Anyone seen Stovetop stuffing boxes or cornbread mix in Taipei?) Now I have a great group of family and friends to share the night with, and I take a moment to remember to be grateful for them and all that I have in my life. So whether you just moved to Taipei, happen to be here on a business trip, or are just craving some turkey, here's a round up of options for you and yours. Some pricing may vary, had to base it on last year's pricing for some. Make your reservations now and if you pick buffet style, show up early to make sure you get enough turkey. Some restaurants offer turkey dinners throughout the weekend. Check last year's Taipei Times article for details on the above restaurants. Roasted fresh Taiwan turkey (from carved turkey, seconds allowed), with potato dinner roll, spinach gorgonzola candied walnut salad, stuffing, roasted garlic mashed potatoes, gravy, orange cranberry sauce, spicy roasted sweet potato, crispy shallot string beans, herbal butter corn on the cob, pumpkin pie with fresh whipped cream and spicy hot apple cider. Roasted turkey (5kg) NT$3,000 or (7kg) NT$4,000- Terrazas Cabernet Sauvignon Red Wine, Meat Sauce, Cranberry Sauce, Brussels Sprouts, Caesar Salad, Sweet Potato and French Bread. 10 percent discount for orders over NT$5000. Sage roasted turkey (5kg) NT$3,980- cranberry sauce and gravy, mashed potatoes, beet salad, homemade Focaccia bread and a hand-made pumpkin pie. So where have you had Thanksgiving in Taipei? At home after slaving over a hot oven all morning? Or taking it easy at one of the other restaurants in town? Let me know if I've left one off the list, or if there's one that's better than the rest! It doesn't quite feel like a holiday with most people having to go to the office or school on Thursday and Friday, but at least we can eat some turkey. When I was in high school, oh so long ago, we had a food fair. I don't remember much except that we marinated chicken and made over 100 teriyaki skewers to grill, made paper signs for our booth and it was a in a dirt field at our school for students and teachers to raise money for their clubs. The food fair at the Taipei American School is a fancier and bigger version of that, with parents and local businesses doing the cooking and selling and open to the public. 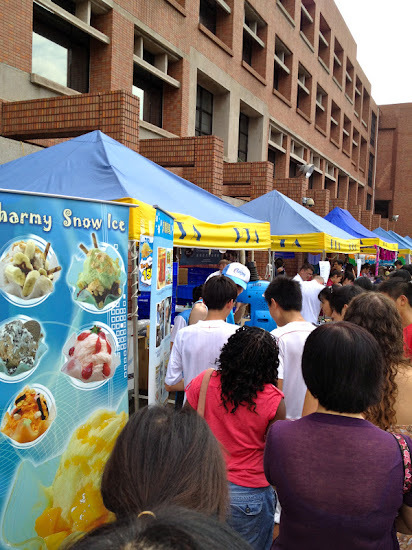 With a NT$20 entrance fee, the parking lots of TAS have been converted into game booths, dessert booths and food booths. There's also performances in the center where I heard Gangnam Style being blasted at least 5 times throughout the morning. 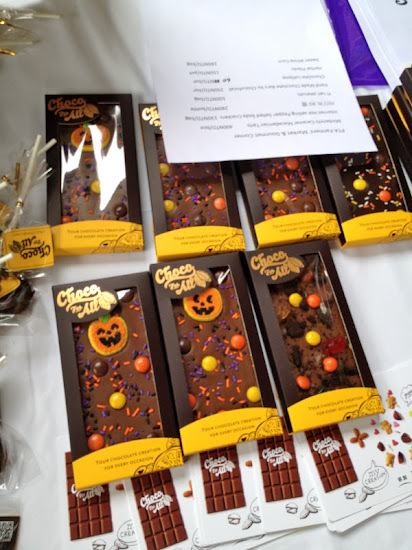 and spied adorable bars of Halloween chocolate and custom chocolate bars from ChocoForAll. It's best to show up early as it gets more crowded throughout the day and sometimes the food runs out and seating is limited. The first year I went, almost everything was gone as I went in the late afternoon. 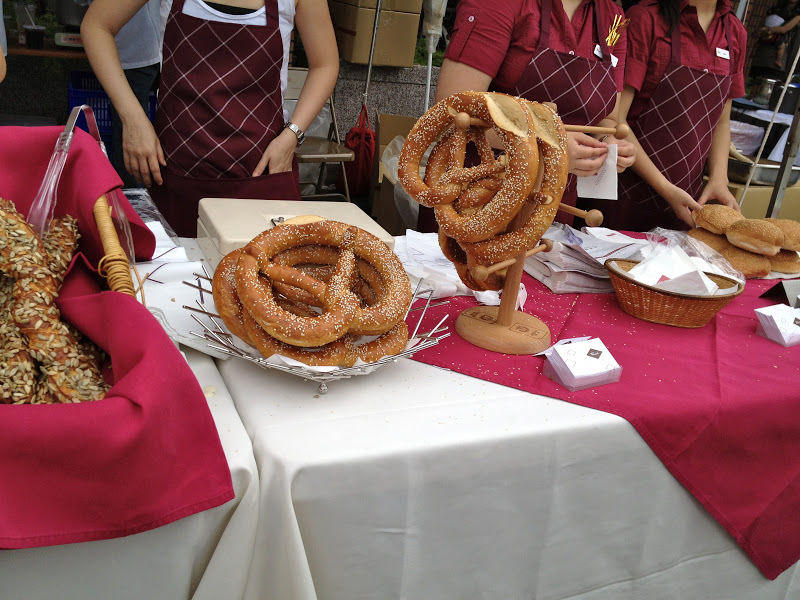 Last year, I grabbed some delish smoked paprika Galician styled octopus from DN Innovacion. 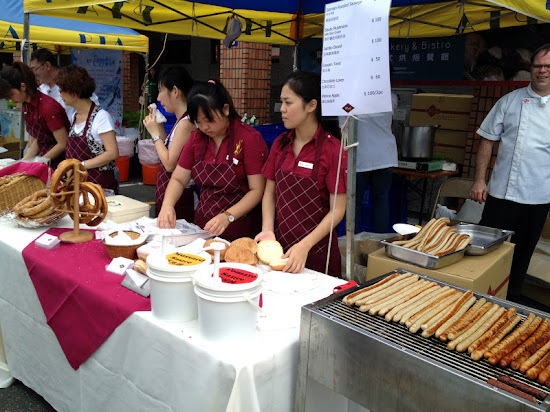 It's a great place to find some different flavors, with booths featuring food from Singapore (laksa and curry chicken), India, Korea, New Zealand (lamb chops), Germany (sausages and bretzels), Indonesia, Brazil, US (Costco hot dogs and chips), Taiwan, Turkey (Turkish ice cream), and more. 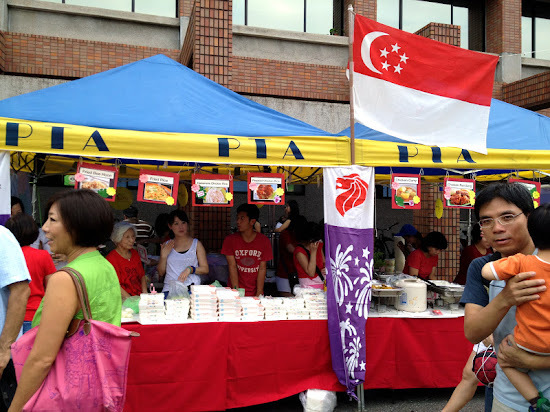 Dishes and packaged in small portions and priced under NT$200. 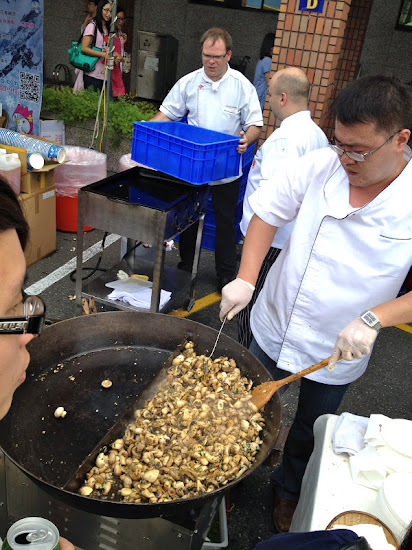 Last year, I waited in line forever for sauteed mushrooms (NT$100) from Wendel's, only to have them run out when I was next in line. 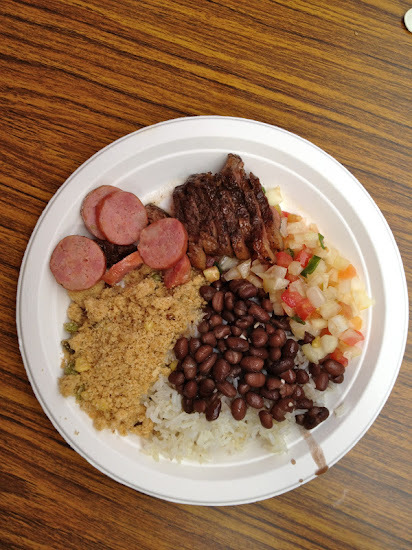 So this year, I had to grab a plate when the line seemed to be moving quickly. 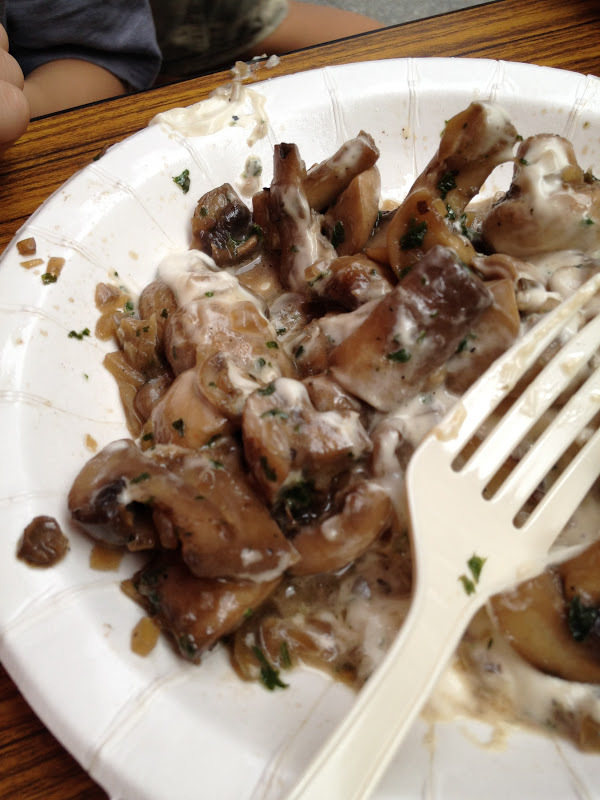 If you don't want to wait in line, you can order the mushrooms at any of their bistros. I admit I'm a creature of habit, so I had to return to get my plate of Brazilian picanha bbq steak plate (NT$150). 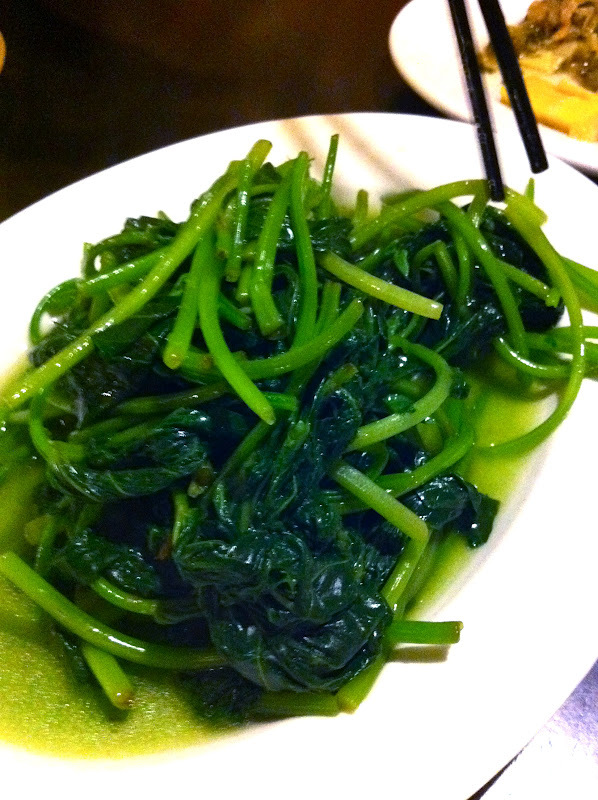 Homemade by TAS parents, it's a dish you're not going to easily find in Taipei elsewhere. 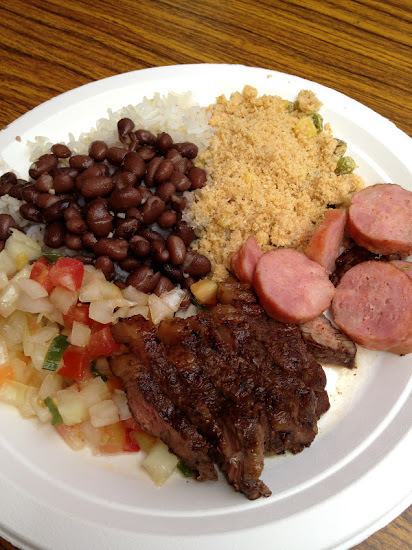 I was a bit bummed to see there didn't seem to be as much steak, since they added some spicy sausage to the plate. So good! Maybe one year they'll offer up fried plantains as a side dish. 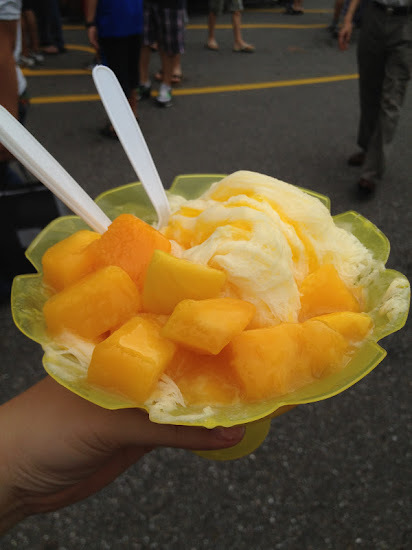 The sun was coming out so it was time to get in line again, this time for mango snowflake shaved ice which came in a handy cone-like plastic cup, which made it easy to walk around and eat. Cute penguin shaved ice machine. 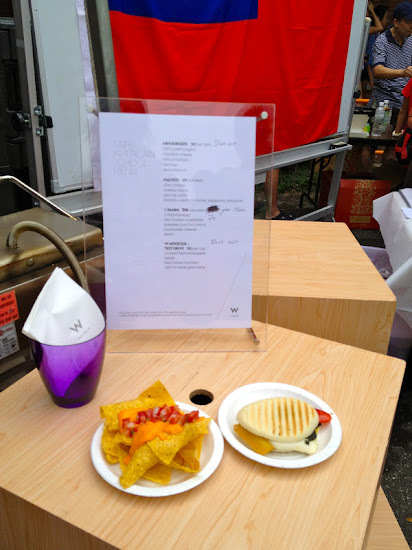 I didn't try it, but even the W Hotel came out this year, with some mini nachos and veggie paninis. They had some cocktails, but were sold out. 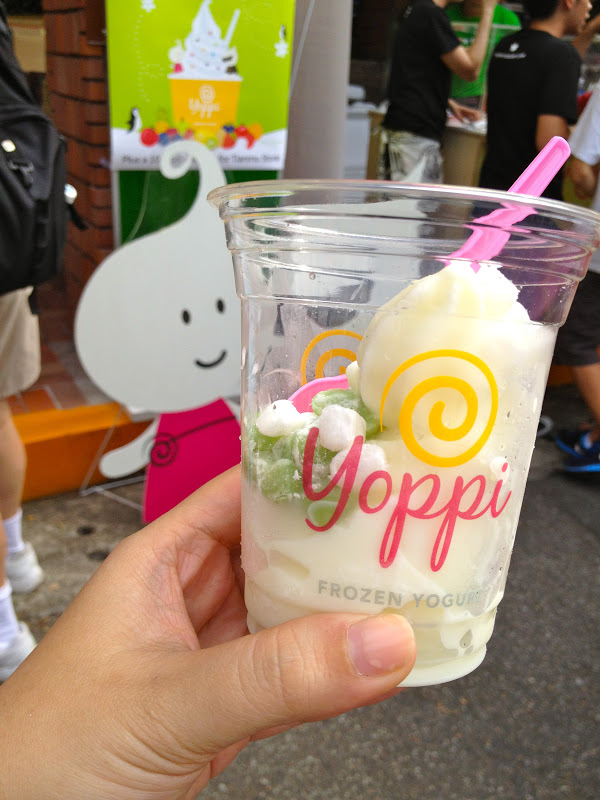 Another option for dessert this year was the new froyo player in town, Yoppi, which was on the game side of the fair. 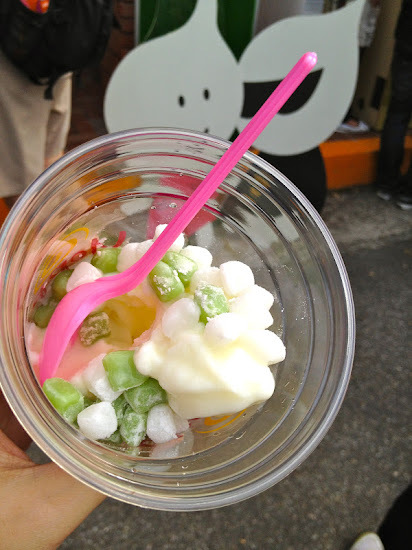 I got a small cup of original tart with two mochi toppings (NT$100).. they have a shop right near the school on ZhongShan, so was doing some promotions. A fun and tasty event to visit if you hear about it, even if you're not a student or alumni (which I am neither!). The time changes every year, but is usually around October. 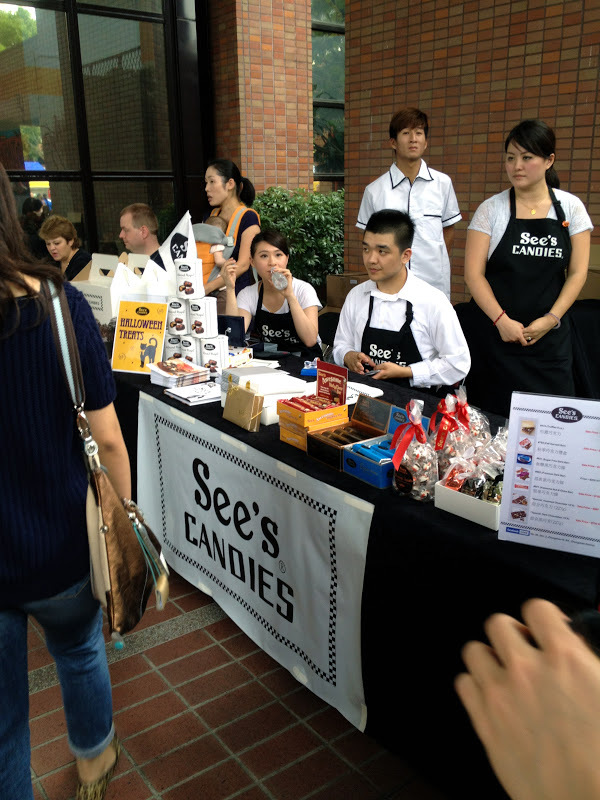 TAS also has various other events open to the public during the year, as does TES, the European School, but the food fair is the only one I've ended up checking out. Expect to wait in a lot of lines, but bring some friends and flashback to your days in high school.